Greenhouses at six degrees. Brrrr. Below freezing for 10 days and this was the lowest point. Ironically, all of the greens survived the deep freeze, but all of the large outer leaves that we were harvesting are cooked. Cells ruptured by microscopic ice crystals, limp and soggy. Eventually, the growing point in the center of the plant will produce new, healthy leaves, but sadly, that will be weeks or even months from now. We are so relieved that the temperature has warmed up and the ground is finally thawed. We are also relieved to find that the carrots and beets have survived, thanks to their natural anti-freeze—sugar! 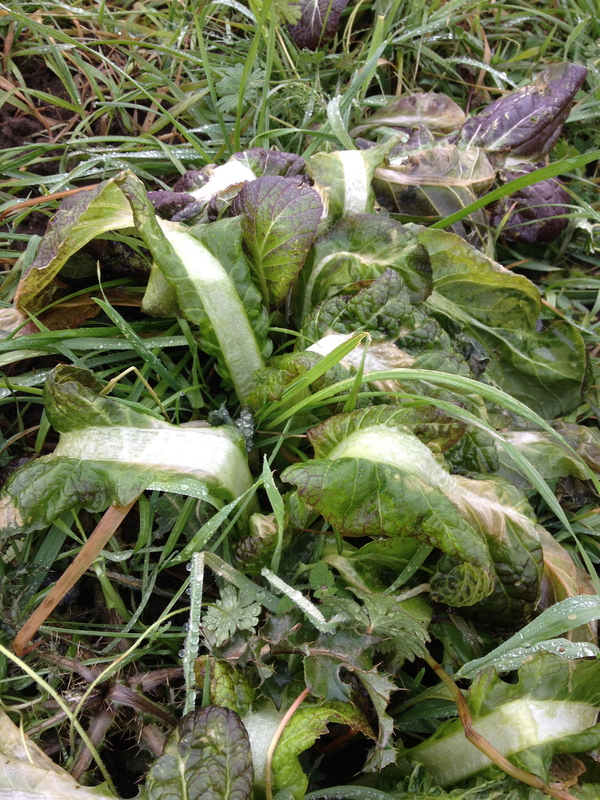 The greens actually all survived, but the large, outer leaves are damaged and not harvestable. They will recover, in time, but probably not until closer to spring. 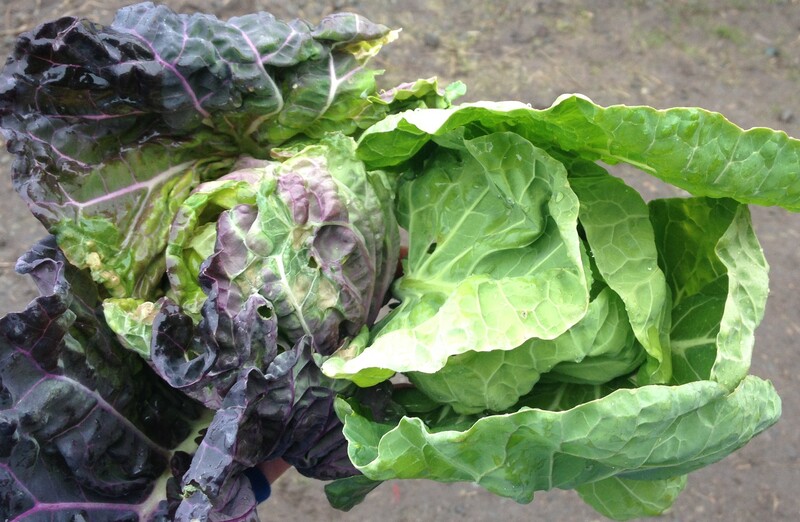 The cabbages and Brussels sprouts are all fine, and so we are going through them this week. We are still hopeful about putting together some kind of stir-fry mix in two weeks when we return after the holidays, but time will tell. Cabbage and Brussels Sprouts are cousins, and they look almost the same from the top view (aside from the difference in color). Cabbage head on the left, Brussels Sprout top on the right. They look different on the bottom-side—Brussels Sprouts on the left, with tiny sprouts in the leave junctures (where they meet the stem) and Cabbage on the right, working on getting a head in life. 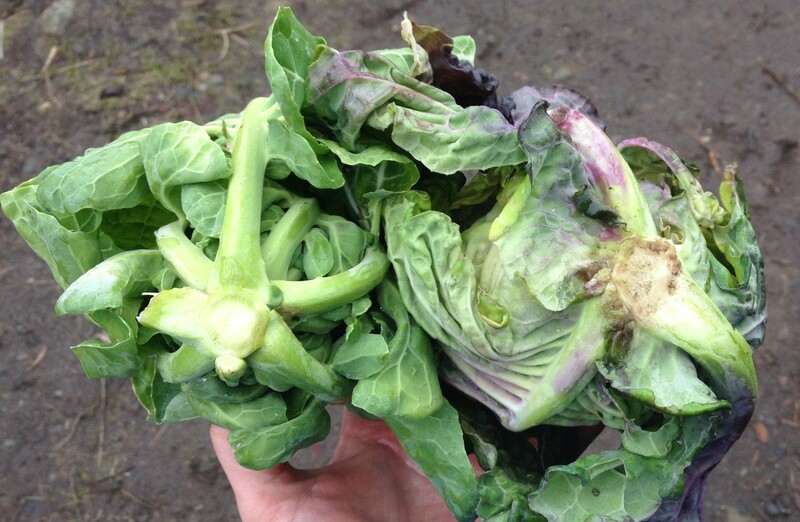 The brassica family is an interesting one, and a large one full of mutants-turned-new varieties. Brussels sprouts are basically just cabbages that stretched out in height and instead of growing a single, large head, started producing tiny heads in its leaf joints. No genetic modification, only selective breeding and natural mutation in the field. We hope to be harvesting ours for you after the holidays. Because we are lacking leafy things, we have loaded you up with root crops—lots of carrots, (beets), and potatoes. And a few squashes. We’ve been saving the last of the shallots for this week, and we threw in some Thyme to go with all the spuds. This is the last harvest before the new year, and we want to wish you the happiest of holidays and good health. Thank you for your ongoing support of our farm and our family. We wouldn’t be here without you. The New Year is upon us at last. I’m not talking about January 1, the modern new year. I mean the original new year—the new year of ancient times and farmers. The Winter Solstice. This day of the solar year with the longest night, and the shortest daylength has historically been very significant with all cultures in the northern hemisphere, especially farming cultures. All living things (aside from modern man with artificial light) base their life processes on the amount of natural light in each given day. For example: Chickens have a 21-hour egg-laying cycle. They create a new egg every 21 hours, and as long as the egg is completed during daylight hours, the hen will expel the egg. If the egg is formed in hours of darkness, she keeps it safe inside her until daylight returns. (During the summer when our days are about 19 hours long, a hen will lay an egg nearly every day, but in the winter when our days are only 8 hours long, that same hen will lay an egg only every three or four days. Commercial hens are kept with lights on 24 hours a day, to maximize production. Daylength also triggers the heat cycles of mammals, especially grazers like goats & cows. Their biological clocks time things just right, so that babies are born when mom’s food is abundant. As far as plants are concerned, temperature is less of an issue than daylength. Plants are only able to perform photosynthesis with light. Since photosynthesis is what gives plants energy for growth, most plants stop growing when the daylength gets down to about 10 or so hours. Active plant growth doesn’t start up again until thelengthening days of spring arrive. Then, the plants wake from their winter dormancy and sprout new leaves to soak up all that sunlight and the chickens start pumping out eggs like crazy. In farming terms, the solstice is a much more meaningful day than January 1, Julius Caesar’s new year. But he wasn’t a farmer, he was a politician. The day after the solstice, we can look forward to more eggs, more greens, and it means that soon we won’t have to do our chores in the dark. It’s time to order seeds for next year, and in a few weeks it will be time to start transplants. Spring is just around the corner! If you haven’t seen them yet, be sure and drive by the Carpinito fields on West Valley Highway. There are Trumpeter Swans. Quite a few big, white goose-looking birds and a few greyish juveniles. There have also been some in his field at 277th St. and Central Ave. It pains me to think of all the chemicals they’re ingesting when they clean up the old corn and pumpkin patches, but hopefully it’s not doing them too much harm as they won’t be here very long before they move on. The day after the solstice, we can look forward to more eggs, more greens, and it means that soon we won’t have to do our chores in the dark. It’s time to order seeds for next year, and in a few weeks it will be time to start transplants. This weekend is the last pickup, so if you won’t be around this weekend you’ll want someone to pick it up. Lots of carrots!